Recently there have been quite a few patients presenting to me at Farringdon Osteopaths with neck and shoulder discomfort who, on examination, have been found to be breathing primarily into the upper ribs and chest instead of the lower ribcage and abdomen. Some of them had some history of anxiety, gastro-intestinal problems or migraines and all were surprised to be told that their breathing mechanics were incorrect. Some patients really struggled to breathe into the lower rib cage and abdomen when we went through a guided breathing re-training exercise. After a few weeks, those that stuck to the breathing re-training exercises reported feeling better for it. These exercises are described at the end of the article. But why are breathing mechanics so important and how does breathing play a role in our health? Breathing can have a huge effect on our health in a number of ways. Not only can poor breathing mechanics and a rapid breathing rate lead to neck and shoulder stiffness, but a lesser known fact is that this can also contribute to poor systemic health and poor tissue oxygenation. To understand how, it is important to first understand the mechanics of breathing. Normal breathing at rest primarily involves the diaphragm muscle, an enormous dome shaped muscle found at the lowest point in the chest cavity that attaches to the lower 6 ribs and forms the floor of the thorax and roof of the abdominal cavity. 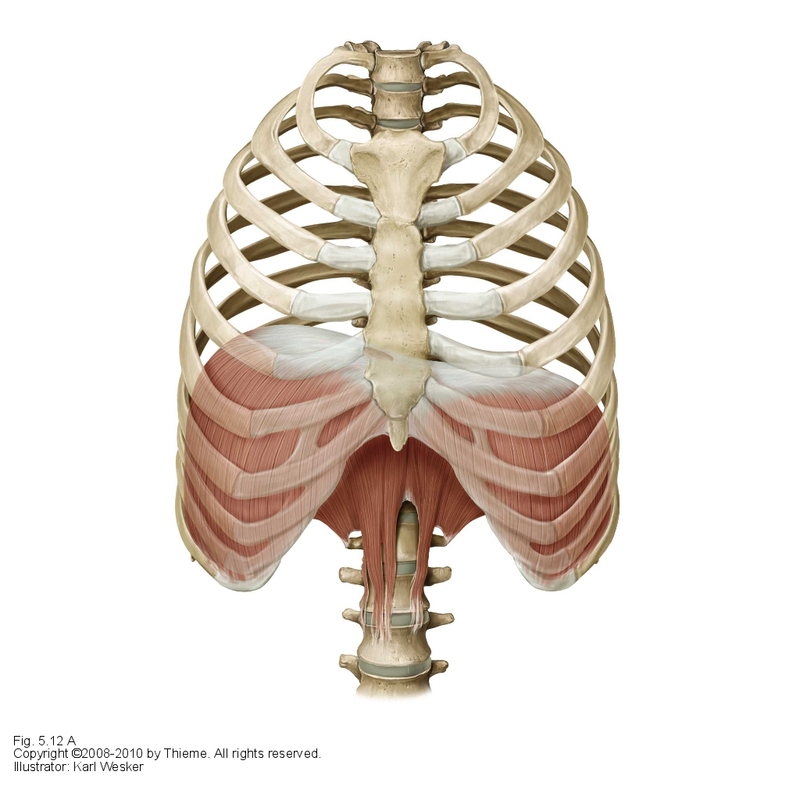 This muscle contracts, pulling downwards like a plunger, drawing air into the lungs and expanding the lower rib cage. You can see this clearly in a baby or young child where the breath goes straight into the abdomen. When more air is required, such as when exercising, then the muscles of the neck and shoulders and at the front of the chest are recruited to draw the upper ribs upwards, further filling the lungs to support the diaphragm and provide more oxygen to meet the demand from the body and to get rid of excess carbon dioxide building up from the exercise. When a person goes through a period of stress, the fight or flight response is triggered in the same way as when exercising. The upper ribs start working, even though the person is not exercising and the breathing rate increases. The neck and shoulder muscles, working hard to keep the upper ribs moving, can become tight and tired and the neck starts to become stiff. What’s interesting is that if this stress continues for a long time, then the body forgets that this is an abnormal way to breathe and when the stress passes, the person continues to use these upper ribs for breathing at rest and a more rapid rate of breathing may also be retained. This can produce long term tension and stiffness in the neck and shoulder muscles as these muscles regularly become fatigued. But the health implications for chronic upper rib breathing don’t end with neck and shoulder stiffness. The same diaphragm contraction that draws air into the lungs like a plunger also has an important role as a pump for the circulatory system, drawing blood back into the chest from the legs and abdominal cavity below as the pressure in the chest cavity changes. This exact same mechanism also provides circulation to the lymphatic system, ensuring that your immune cells are being pumped to all parts of the body. When the respiratory rate is too fast, as in hyperventilators, the body exhales too much carbon dioxide. This changes the pH of the blood, so that the oxygen in it binds too strongly to the red blood cells, and so less oxygen passes from the blood into the muscles and organs. This confuses the brain into thinking that there is not enough oxygen, when there is plenty – it’s just not being released from the blood, and it triggers the breathing rate to escalate again making the situation even worse. The person feels out of breath and maybe dizzy. If the breathing rate doesn’t normalise then the fight or flight response is triggered and a feeling of panic overcomes the person. This is a panic attack. But a panic attack is an extreme scenario, and most chronic hyperventilators that I have spoken to have had maybe one or two panic attacks in their lives, if any at all. However when you consider the facts…..if hyperventilation causes poor oxygen delivery to all of the bodies tissues, then the potential health implications of chronic hyperventilation could be quite considerable. From chronic tiredness and poor memory due to sub-optimal oxygenation of the muscles and brain, to IBS due to sub-optimal oxygenation of the digestive system; chronic hyperventilation could really affect how well you feel in yourself. 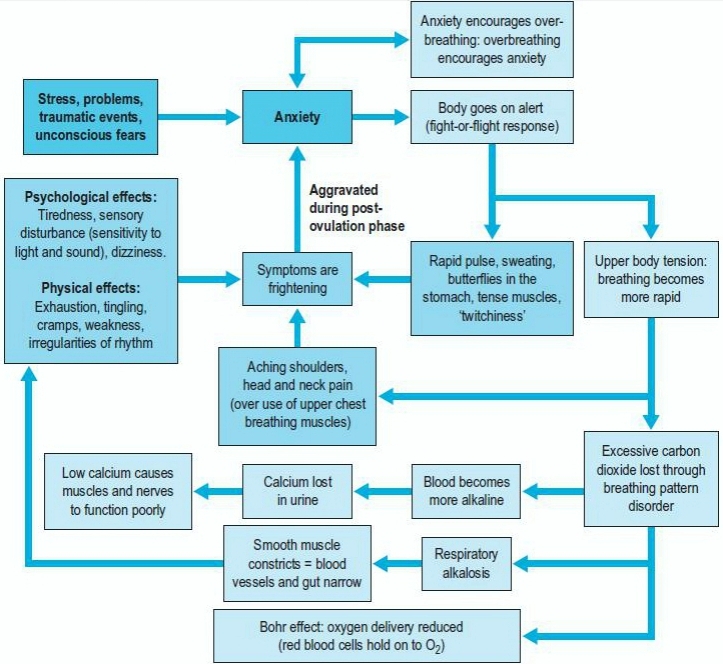 The chart below shows the process and the resulting symptoms of hyperventilation. So what can we do about it? How do we know if we are upper rib breathers or hyperventilators? Look at yourself in the mirror without your top on. Breathe normally. If you are an upper rib breather you will see your shoulders moving upwards with each breath in. Your shoulders shouldn’t move upwards when breathing at rest. If you suspect that you may be a hyperventilator and have been experiencing any of the symptoms described above, then it is really important to see your GP so that other possible causes for your symptoms can be eliminated. If hyperventilation has been determined to be the most likely cause, then a simple breathing exercise can help to retrain your respiratory rate. To retrain into an abdominal breathing pattern, lie on your back with your hand on your abdomen just below the ribcage and the other hand on the breast bone. Take a normal breath in, using your hands to feel that the breath is going into the lower ribs and abdomen and that the breast bone is not moving. This is lower rib, abdominal breathing. Practice 20 or 30 breaths each night as you go to sleep. To retrain for hyperventilation, the above exercise can be modified slightly. Whilst lying on your back practicing breathing into the lower ribs, change your breath so that you are breathing in through the nose for 2 seconds. Then purse your lips – as if you were about to whistle – and exhale for 6 seconds. Stop if you feel dizzy. Start with 5 breaths and increase by 1 breath per night until you can do 20 or 30 breaths quite easily. Gradually these exercises will become easier and feel more natural and then you can practice doing them throughout the day when sitting at work, waiting in traffic or watching TV. In time, with retraining, your breathing pattern will normalise and you will and gain all of the health benefits that come with it. When you next experience a period of stress, knowledge of these breathing exercises can really help to reduce the toll that it takes on the body and help you manage the symptoms of stress more easily.